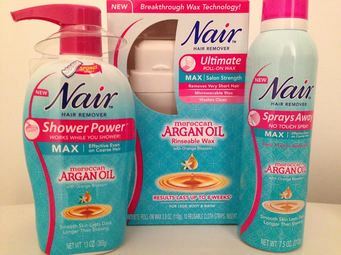 Nair Brings You Moroccan Oil for Your Body! - Nair Glides Away: A depilatory for the Bikini, arms and under arms that allows for no-touch application. It has maximum strength for any type of hair and it lasts longer then shaving! Perfect size and bottle to travel with! - Nair Ultimate Roll-On Wax for Face - This little tube provides a big impact with salon results! This wax is formulated to be water rinseable so it washes clean! -Nair Precision Kit for Face & Upper Lip- Precision hands-free applicator for the face! -Nair Ultimate Roll-on Wax for Body- This is a microwavable roll-on wax for legs, body and bikini! It microwaves in just 25 seconds and the results last up to 8 weeks! - Nair Sprays Away- A depilatory for the legs and body that you spray on! Must be sprayed on dry skin and then removed with a damp washcloth! -Nair Shower Power is an in-shower depilatory that you can use while your in the shower!